As it stands, Trompe le Monde takes its place as one of the finest swan songs ever recorded. If the Pixies wouldn’t have broken up right after its release, there’s no telling what would’ve happened. All that you need to know is that the 15-track effort is as hard rocking and brilliantly innovative as any of the group’s creations. That’s no small feat. Mastered from the original analog tapes and pressed at RTI, Mobile Fidelity’s numbered limited edition 180g LP presents the ensemble’s abrasively melodic landmark in a fidelity it’s never enjoyed in any prior version. 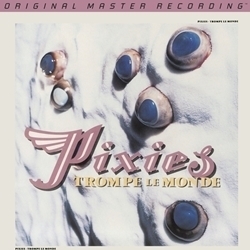 Featuring lusher keyboards and moodier soundscapes than its predecessors, but also reclaiming the nasty guitar edginess and swooning distortion of the group’s earliest efforts, Trompe de la Monde finally comes across as the Pixies intended: A sonic bridge between college-rock’s influential cruder-textured albums and the polished professionalism that distinguished alt-rock classics. In other words, Mobile Fidelity’s version presents it as the perfect-sounding album: Replete with grit, rawness, and character, but mixed in with radio-friendly smoothness and virtuosic professionalism. Awash with incredible timbres and tonalities, myriad new details rise to the surface. Listen to the counterpoint melodies and layered vocals on “Letter to Memphis”; the trash-compactor feedback and thumping bass during the whipsawing “Planet of Sound”; the “Spyhunter”-like pace and limitless depth now present on “Subbacultcha.” Dynamics, contrasts, low-end frequencies, and imaging are all significantly enhanced. Compared to the original CD, Trompe le Monde emerges as a new album—a sonic wonderland that’s not far removed from that of Nirvana’s celebrated blockbuster Nevermind.